North Dakota artist Walter Piehl completed his undergraduate study at Concordia College in Moorhead, Minnesota, and his graduate study at the University of North Dakota and the University of Minnesota. Afterwards, he taught painting at Minot State University for nearly five decades before retiring. 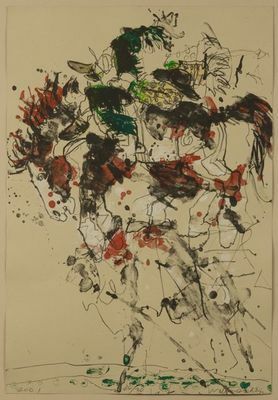 Recognized as a leading proponent of contemporary western art, Piehl uses a highly expressive technique akin to Abstract Expressionism, often combined with rodeo themes. Piehl’s untitled lithograph was produced for a portfolio of prints developed by UND Professor Kim William Fink.